A pedestrian who was struck by a vehicle during a hit-and-run early Friday morning in Napa died this morning and police are now asking for the public's help to locate the driver of the vehicle. Michael Daniel Green, 54, was walking in the area of Monarch Drive and Byway East around 2:15 a.m. when he was struck by a vehicle, police said. Green was taken to Queen of the Valley Medical Center, where he later died, according to police. 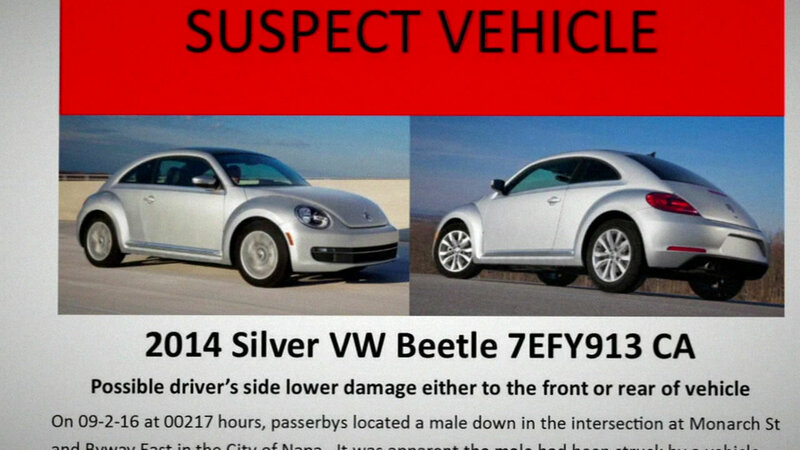 Based on evidence at the scene, police believe a 2014 silver Volkswagen Beetle with a license plate reading 7EFY913 was involved in the deadly hit-and-run. Damage is suspected on the lower part of driver's side of the vehicle, police said. Police believe the driver of the vehicle may have hidden it in a remote location, or possibly a storage unit or garage. Anyone with information about the vehicle or its driver is asked to contact Napa police at (707) 253-4452. Anonymous tips can also be texted to 847411 with the word 707NPD at the beginning of the message.